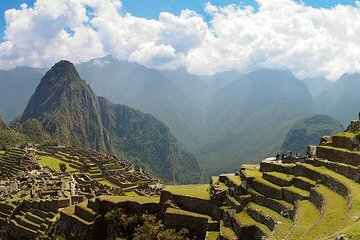 Explore the famous Inca citadel of Machu Picchu on a full-day tour from Cusco. Take the train to Aguas Calientes and then follow your guide on a 2-hour walking tour of the ruins. Visit key landmarks and learn about the Inca empire before exploring the sites on your own. Enjoy a delicious lunch at a local restaurant in Aguas Calientes before heading back to Cusco by train. A must see place Machu Picchu. The tour was well organised, all in time. The lunch was in excellent restaurant. If you are short of time and do not want to stay overnight in Aquas Calientes this tour works well. The company is very professionally run with everything taken care of and wonderfully punctual. I was picked up in Cusco and delivered to Poroy station for the train trip. All the documentation was ready for me and everything explained. The agents at the other end were equally well-organized. Our guide, Edgar, was excellent - enthusiastic, knowledgeable with very good English. He was very thorough and did not rush us through the visit. The meal proivided at the restaurant was very good. This tour is highly recommended. A very organized tour. Good job! !